Canada’s science-based approach to forest management allows for sustainable harvests, while creating over 216,000 direct jobs. This injects nearly $20 billion in our economy. This approach allows Canadians to profit from one of our most important renewable natural resources, while ensuring that future generations have the same opportunities. It’s something we should be proud of, says the federal government’s Minister of Natural Resources, Greg Rickford. Natural Resources Canada (NRC) keeps a close eye on our forests, encouraging best practices, enforcing the laws that protect endangered species and supporting scientific research. Every year NRC releases an annual report, The State of Canada’s Forests, which is available online. The details in the government’s report show just how enviable this record really is. To begin, forests that are harvested in Canada almost always remain a forest. Right after harvesting, natural regeneration takes place by itself and foresters plant new trees to supplement that process as necessary. Canada maintains stable forest cover and minimizes overall loss through a combination of natural regeneration, tree planting programs, strong regulations and effective enforcement mechanisms. This is different from deforestation, when trees are cut down permanently so that the land can be used for something else, like powerlines, farming or as part of urban development. Deforestation is very rare in Canada. In 2013, 0.01% of our forest area was deforested, mostly due to land clearing for agriculture and infrastructure for oil and gas. Canada’s share of sustainably managed forests far outpaces our share of the world’s forests. While 41% of the word’s certified sustainably managed forests are located here, it is interesting to note that Canada is only home to 9% of the world total forests. Those certified sustainable forests represent an area of 153 million hectares, almost 44% of Canada’s entire forest area of 348 million hectares. And, of course, forests are renewable. In fact, forest companies and provincial governments are legally required to regenerate all forests harvested on public lands. Since 94% of Canada’s forests are public, these regeneration requirements apply to the vast majority of harvested areas. While much of that happens naturally, forest companies also play a big role. Resolute alone planted 60 million seedlings in 2012. In Quebec, the government took over tree planting responsibilities in 2013 as part of a major forest tenure change. Sustainable forest management planning and 100% regeneration make sense, since in the forest industry, sustainable forests make for sustainable business. A significant portion of harvested areas in Canada naturally regenerate, while the remaining areas are planted by hand, through aerial seeding or using other methods. 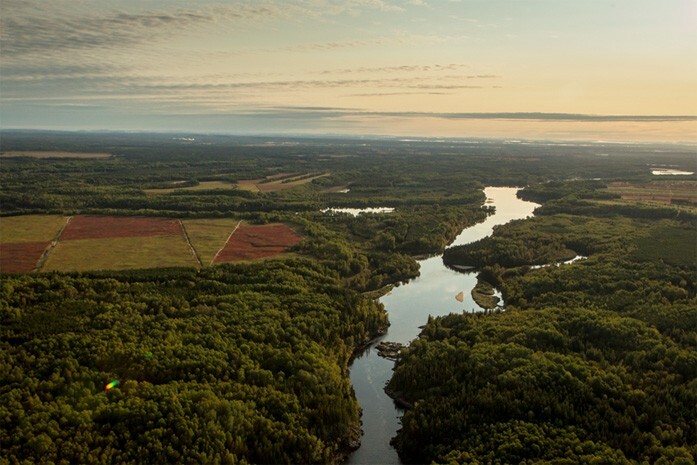 No matter the method, successful regeneration ensures that these forests continue to provide ecosystem services such as biodiversity conservation and wildlife habitat, water quality controls and recreation areas. Even though harvests only impact a tiny percentage of Canada’s forests, it has a huge impact on our economy. The forest products industry directly employed 216,500 people in 2013. Counting indirect employment, that number rises to 320,000. They’re good jobs too. Workers in pulp and paper products manufacturing, as well as those who work directly in forestry and logging, earn wages above the average for all manufacturing sectors. That means big benefits for Canada’s economy. In total, Canada’s forest industry contributes $19.8 billion to our Gross Domestic Product (GDP), 1.25% of the total GDP. While that’s smaller than some other resource sectors, it’s still a major contributor to our economy, especially for the hundreds of rural communities that depend almost exclusively on the forests for their development. For every dollar of value added, the forest products industry creates more jobs and exports than other resource sectors, including the minerals and metals sector as well as the energy sector. The forest products industry is particularly export-focused. In 2012, exports of forest products were worth $28 billion, almost 6% of all Canadian exports.